Now offering high class local physiotherapy to the areas of South Cardiff and the Vale including Cardiff Bay, Penarth and Barry. Based within Dragon Crossfit Gym, it offers free parking for patients and a waiting area where patients and anyone accompanying them can relax while waiting for your appointment. The treatment room is on the first floor with access by stairs, therefore any patients with disabled needs or who struggle with stairs are advised that our Llanishen Clinic may be better suited. If you are heading down Penarth Road away from town (ie. away from Callaghan Square), at the crossroads at the back of the Central train station turn left into Dumballs Road. Immediately turn right between the AA building and the Black Horse Building into Curran Road. Follow the road round for approx 250 metres. 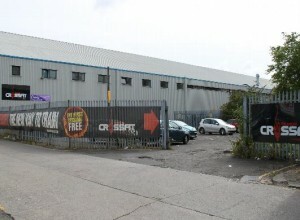 There is a sign saying “Priority Business Centre” on the building on your right, after this building there is a fence with a banner saying Dragon Crossfit (see below) park in the car park by the trees and go upstairs to reception through the door in the corner with the Cabinet Factory on your right. The entrance is not by the blue door. The clinic is upstairs in Dragon Crossfit.